SAN DIEGO (CNS) — During the first day of production on his most recent film, Preston Yarger was concerned for the well-being of his cast and crew. “It was 40 degrees and raining all day long, and everyone was soaked to the bone and just completely shivering,” the 21-year-old recalled. But as it turned out, he needn’t have worried. The reason for that excitement was that they were working on a fan film inspired by a beloved science-fiction franchise that had captured their childhood imaginations. “Scout: A Star Wars Story” is a short film co-written and co-directed by Yarger and Nicolas Alayo, both film students at John Paul the Great Catholic University in Escondido. It has been uploaded to YouTube and will be entered in an annual “Star Wars” fan film competition. Set during the events of “Return of the Jedi,” the last installment of the original trilogy, it’s the story of Rebel soldier Dax Orrell (Louie Chapman), who regains consciousness after a battle on the Forest Moon of Endor, discovering that his battalion has left him behind and that he is being doggedly pursued by an Imperial scout trooper, TB-434 (Jonathan Carlson/Reno Muren). There are no Jedi in the film and no lightsabers, said Yarger. Nor do any famous “Star Wars” characters make appearances, although some iconic spaceships like a Star Destroyer and TIE fighters do appear in some scenes. Alayo said that the story is such that, if the characters were removed from the “Star Wars” universe entirely and inserted into another historical or fictional conflict, the film’s core themes would remain intact: two enemies recognizing their common humanity and realizing that each is being driven by deeply held beliefs. But, because the filmmakers are lifelong “Star Wars” fans, they still felt a tremendous responsibility to create something worthy of the popular franchise. 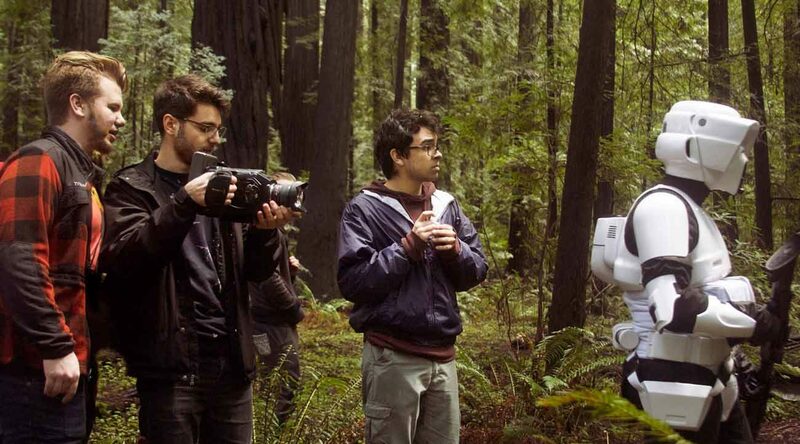 After raising more than $3,600 through the crowdfunding website Indiegogo, they spent two days in mid-February filming in Humboldt Redwoods State Park in Northern California, where scenes from “Return of the Jedi” had been shot more than three decades ago. Yarger told The Southern Cross, San Diego’s diocesan newspaper, the entire crew was excited to be filming at a location “where part of our childhood was formed.” Alayo recalled how “unreal” it felt after the 14-hour drive from San Diego to be standing on “Endor,” a place that he had thought of as “extraterrestrial” since his youth. The filmmakers also partnered with the 501st Legion, an organization of “Star Wars” fans who construct and wear screen-accurate costumes of stormtroopers and other villainous characters and often do so in support of various charitable causes. Carlson, who played the scout trooper and wore his own uniform in the film, is a member of the 501st Legion’s Golden Gate Garrison, based in San Francisco. For the other costumes, Yarger said, the filmmakers paid “painstakingly close attention” to make them as accurate as possible. Alayo said they also closely studied the “Star Wars” films, re-watching the Endor scenes and noting the types of camera movements that had been employed. They paused the video frequently during special-effects shots, analyzing such things as how laser beams discharge from weapons, to figure out how to replicate them. A junior at John Paul the Great Catholic University, Alayo said he was attracted to the school by “the promise of being able to pick up a camera and actually shoot things, as opposed to just learning film theory.” A self-described “hands-on learner,” he said that knowing how to work on and to run a film set is an invaluable skill. Yarger, who will be graduating in September, knew he wanted to study film. He wanted to attend a smaller school where he could get “all the hands-on experience I want” not feel “lost among the masses” at the University of Southern California or the University of California, Los Angeles. He wasn’t initially interested when his mother suggested John Paul the Great Catholic University, figuring that the Catholic college’s film output likely consisted of overtly Christian dramas like “God’s Not Dead.” But when he watched some of the videos produced by the university’s students and realized that they were quality films with wide appeal and Catholic undertones, he was intrigued. As a fan film, “Scout” is a not-for-profit venture. But, for Yarger and Alayo, the making of the film was its own reward. Grasska is assistant editor at The Southern Cross, newspaper of the Diocese of San Diego.